On 8 July, the Parliament adopted its position on the negotiations on a possible trade- and investment agreement (TTIP) with the US. With this agreement, we want to stimulate the economic recovery and job creation, an aim which we can support. However, EUCDW also shares the concerns of the Christian-democratic workers’ organisations and calls for a balanced agreement with respect for the highest social, environmental and health standards. That is our precondition. These conditions are clearly reflected in the resolution adopted by the European Parliament. The most important guideline is that there should be a level playing field for companies on both sides, while safeguarding at the same time certain norms and standards that are important to us. 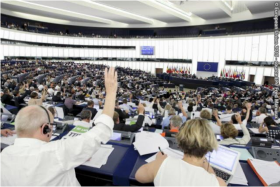 We ask the European Commission to establish a clear list with those standards on which cooperation is possible, and those standards which must be protected, thereby stressing that the Parliament maintains the final say. Therefore we also ask a clear list of services that can compete on each other’s market, from which public services, such as education, health care, social services and water distribution, are clearly excluded. In that manner, we ensure that our governments, national, regional and local, maintain the full right to legislate. The Parliament also sends a clear signal to Mrs. Malmström, who negotiates on behalf of the EU, concerning the protection of investors who invest abroad: such mechanism for arbitration must be rethought and is only possible on the condition that democracy is not infringed. The only good solution in the medium term is a permanent international arbitration court that decides on such cases. Finally, the resolution also stresses that the respect for labour- and environmental norms must stay top of the agenda, both in Europe and in the US. Together with the social partners, the implementation and enforcement of labour conditions should be monitored. A binding chapter on sustainable development must lead both parties to further strengthen labour- and environmental standards and norms. EUCDW calls on the European Commission to follow our recommendations in the negotiations with the US in order to come to a balanced trade agreement for qualitative and sustainable world trade. We will follow this closely in the Parliament. Respect for labour- and environmental norms must stay top of the agenda, both in Europe and in the US.